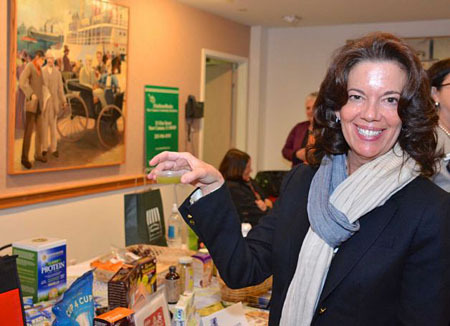 Margaret Wenzel, co-owner of New Canaan Healthfare, sampling "Bikini Body" Organic fresh pressed greens juice, now being featured at the store, along with other Grassroots organic fresh pressed juices, salads and gluten free muffins. We have worked in the Natural Food industry for 30 years. We are a husband and wife team - owners /operators. We work closely with our customer base to stock the store and provide our customers with the highest quality, organic when available, top grade natural foods, vitamin supplements and body care. We have the widest array of gluten-free products anywhere. If you are looking for a product that we do not carry, simply request it. That is the beauty of independent and owner-operated retail stores.